Typical caster/camber plates use a standard COM type bearing in the housing. This bearing is not optimum for this type of application and will usually wear and become sloppy in a short amount of time. QA1 once again leads the industry by developing a specifically engineered asymmetric bearing for caster/camber plate applications. Through this innovative design, the bearing allows for improved load distribution that significantly reduces wear and increased durability eliminating “sloppy bearings” which result in road noise and poor handling characteristics. 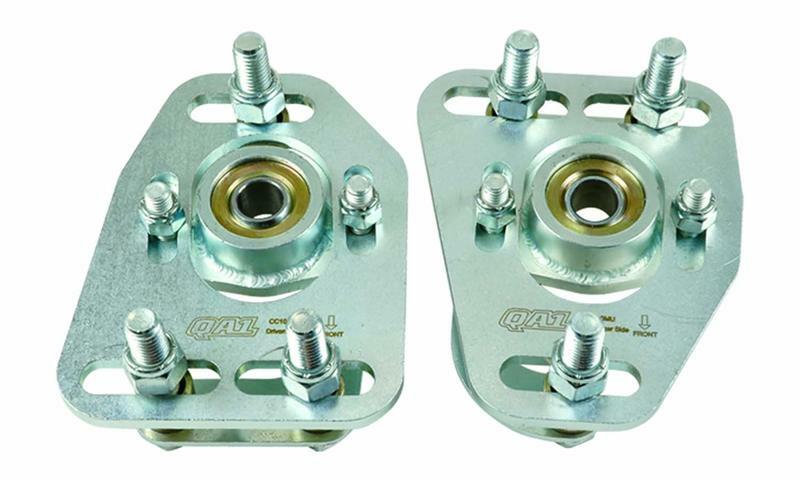 QA1’s high quality caster/camber plates for race applications offer many features not found in other brands. For example, the bearing housing is tig-welded for the utmost in strength and durability. This kit provides caster and camber changes for the ultimate in adjustability.